Acrolinx and SDL have a number of joint customers that use Acrolinx to check documents in a source language and SDL Trados Studio + SDL MultiTerm to translate those documents. Both processes use terminology. Ideally, terminology would be maintained in one system and made available in both. This raises the question which of the two systems should act as the master database for terminology. 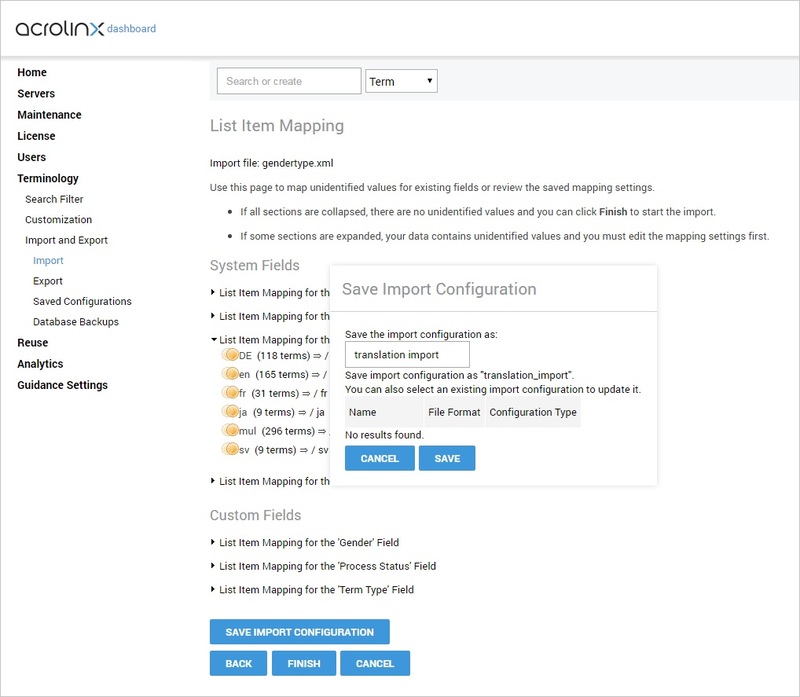 This document describes how to create a roundtrip workflow for your terminology, using Acrolinx as a master database and SDL MultiTerm as a system for translation support and translation of terminology. To use both systems efficiently, both databases should use the same database definition for fields, value lists, and the level at which these fields are defined. 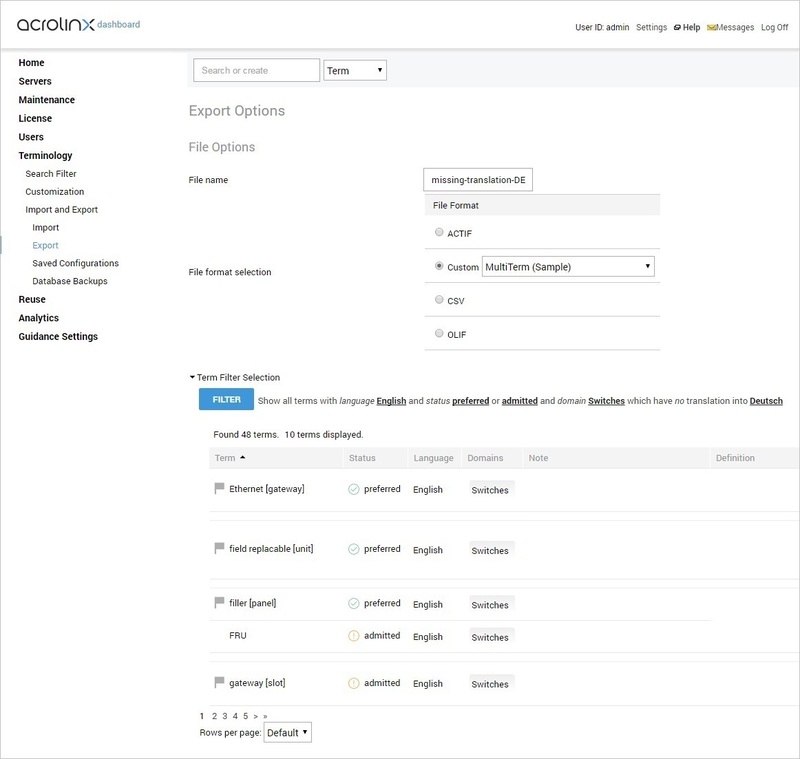 Use Acrolinx to create and administer new terms in your source language. Acrolinx offers term suggestions when checking documents. You can use the Term Contributor web page to propose individual terms. Those terms will be created with the status proposed in Acrolinx. The terminologist can search for newly contributed terms and classify them as preferred, admitted, or deprecated. As soon as terms are classified, they can be loaded for document checking in Acrolinx. The terms are the critical part of your content. They are translated (e.g. by our translation agency) and validated by a subject matter expert in the company (e.g. in the regional sales offices). After that, whole documents are sent to translation. This approach ensures high-quality translation, but requires extra time and resources. While translating a document, translators translate terms when they find a missing translation. If the company disagrees with a translation, both the terminology and documents need to be modified. Translators translate terms when needed, but they do send translations to the company for validation. This is not recommended. 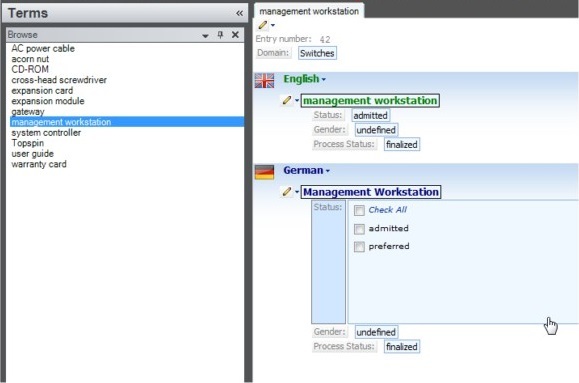 Show all terms with Language English and Domain Switches and Status preferred or admitted which have no translation into Deutsch . 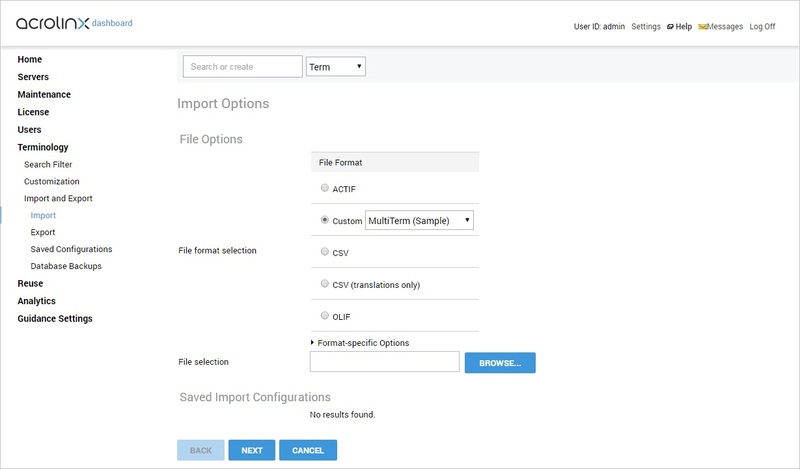 To export, you would select Custom with the transformation "MultiTerm (Sample)." It generally does not make sense to translate deprecated terms because there is no deprecated equivalent in the target language. However, the translator and validator may suggest deprecated terms that they know of from experience. Proposed terms are normally not translated at this stage. Save the resulting file to disk and send it off to the translator. To use the exported data in SDL MultiTerm for translation purposes, you need to import the Acrolinx content into SDL MultiTerm. To do so, open SDL MultiTerm Administrator and browse to the Import node of the respective termbase. Pick an appropriate import definition and process it. 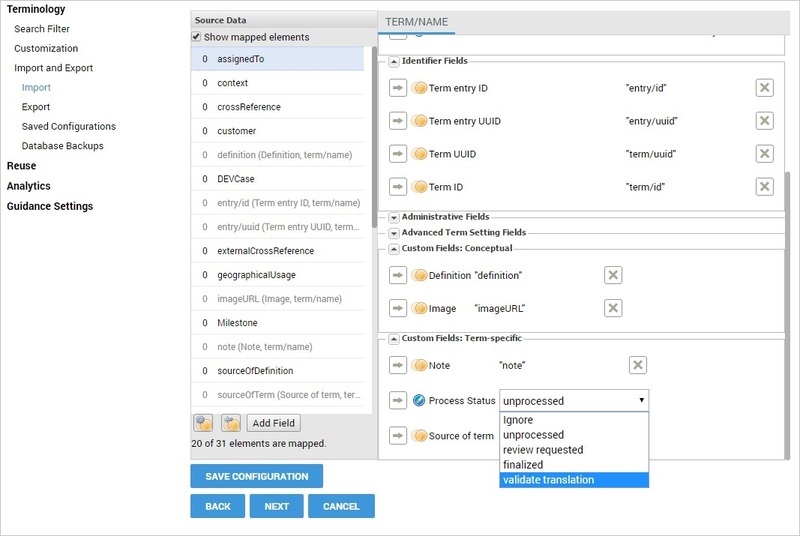 Depending on whether the SDL MultiTerm termbase is still empty or contains terminology already, you can choose from various import options and synchronize content as required. All other fields are optional. To display only those fields which are relevant for a translator, the user can create custom layouts. Once all new terms have been translated, updated or modified, the contents of the database need to be exported for re-import into Acrolinx. To do so, open SDL MultiTerm Administrator and browse to the Export node of the respective termbase. Pick the standard export definition and process it. The contents of the termbase are exported as MTF XML from SDL MultiTerm and can be sent back to the customer. The file returned by the translator contains all terms, new and existing. Acrolinx can be configured to overwrite and replace existing terms or to keep existing terms. The topmost setting UUID (Universally Unique Identifier) is the same as an existing term=Keep existing term prevents duplication of existing terms. You can now import the file with translated terms. Use the settings Custom and MultiTerm (Sample) . 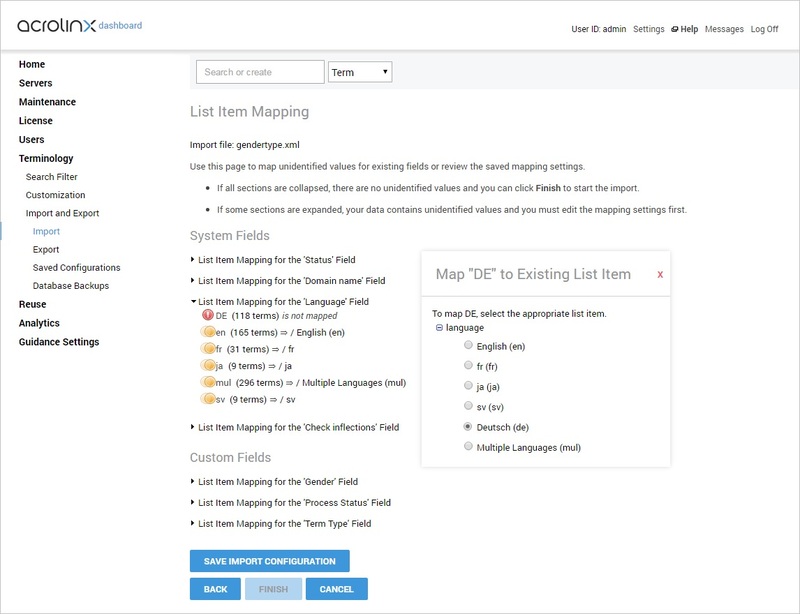 The field mapping wizard is by default nearly completed. 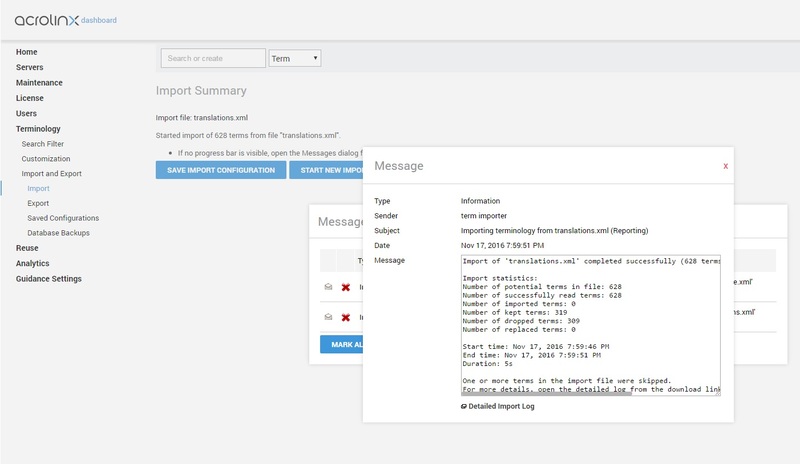 If you want to validate the translations in Acrolinx, then you should overwrite the Process Status and set it to the value validate translation (This could also be done in MultiTerm while creating translations). This enables you to easily find new translations later. Some list values, such as language names, may be defined differently in MultiTerm than in Acrolinx. At this step, they can be mapped to the existing values in Acrolinx. You can save the import configuration for later use. This configuration can also be used to automate a term import from a command-line program. The import runs in the background. A message is displayed once it is complete. As expected, terms that were identical to the original (existing) terms were rejected and only new terms were imported. You can now view all the newly created terms in the term search.